It hasn´t been a long time teaching Spanish but that isn´t a reason to not to speak it. I´m very happy with all the children when they automaticly answer me with things like hola, buenos días, gracias, or they call me "Señor Simón" instead of "Mr Simón" everytime they see me around the school. Not many new things due this really short half term to talk about but here are some. Year 1-2 have been learning new songs like Oh, Oh, Oh, and listening to the March of the Nutcracker Suite of Tchaikovsky. Following the rhythm and making differences between pulse and rhythm. With our instruments we have been working in sequences leading by children and musical phrasing (question and answer). Year 3-4 singing that they are not feeling grumpy! :) This has been one of the songs. Regarding recorded music, we have worked with the "Autumn" movement of Vivaldi to learn about music structures and textures. We carried on with xylophones with good results and challenges for the children. In Spanish, we learnt how to say our birthday using the months and numbers up to 31 (treinta y uno). 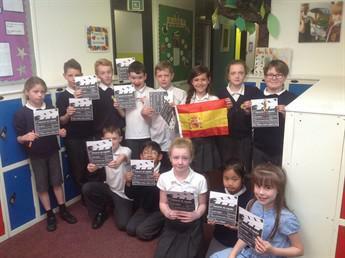 In Year 5, due sats for year 6, we have been working hard in the "I St. Mary´s Spanish Challenge" with fantastic movies from the majority of the groups. Certificates, flags and Spanish pens for winners in the assembly and now, the school looks a bit more Spanish... Important thing due the World Cup is coming and I don´t want to be supporting Spain alone! In music in Y5 we have seen back to our history to look at music from the XVI century which has been adapted into new styles like jazz or reggae. The Spanish club with some Y34 children was great again, it´s absolutely amazing how quick they are learning and their efforts in answering me with an accurate pronunciation. Playing games from Spain I feel like 20 years ago when I was at school.